It's not unusual to want a picture taken from the most flattering angle, but with the rise of sponsored content and photo-editing apps, the standards for beauty on social media are quickly exceeding the reach of many. Brands, armed with professional photographers, custom sets, and marketing budgets, integrate their flawless pictures into consumers’ feeds, while everyone from Instagram celebrities to social media amateurs use services like FaceTune to smooth skin, correct shadows, and trim down their shape. As a result, women who don't embody the ideals they see may feel uncomfortable making their own contributions. 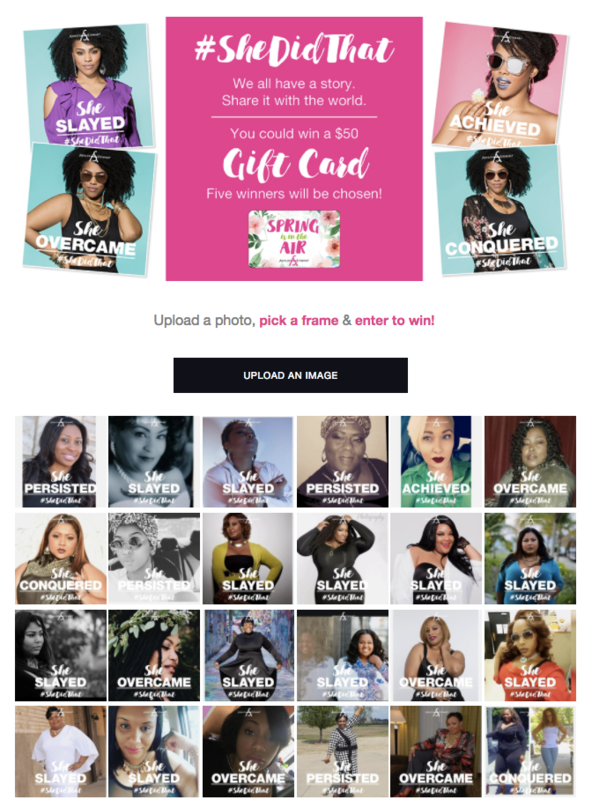 Ashley Stewart, a plus-size clothing brand for women, addressed this reluctance head on with its #SheDidThat campaign, which offers three lessons for any brand trying to expand the diversity of its UGC campaigns. Come in hot. After uploading her photo, a woman could choose from five captions that epitomized the attitude behind the campaign as a whole: She Overcame, She Achieved, She Conquered, She Persisted, and She Slayed. Besides capitalizing on popular sayings, these frames also reinforced the confidence that the brand was trying to elicit from its consumers. Promote your own. In 2016, more than 71,000 women applied to be part of the #AshleyStewartModelContest and win a two-year modeling contract and a photo shoot with the brand. Ilianna Ayala was the top choice, and the four sample photos on the #SheDidThat website feature the Harlem native. You get what you give. In Ayala's sample photos, she isn't covered by flowing clothing or shown only as a beautiful face. She's pictured in a sports bra, wearing a blouse with a deep neckline, and staring at a mini cupcake. By showing off her body, Ayala sends an implicit message for users to do the same — and they did. In a bold and resonant way, Ashley Stewart addressed one of the most common problems for many UGC campaigns: consumer reluctance. While taking and sharing a selfie is increasingly common, some consumers hesitate before exposing their body to the world. The brand not only spoke directly to these women, but it also helped them slay their submissions.